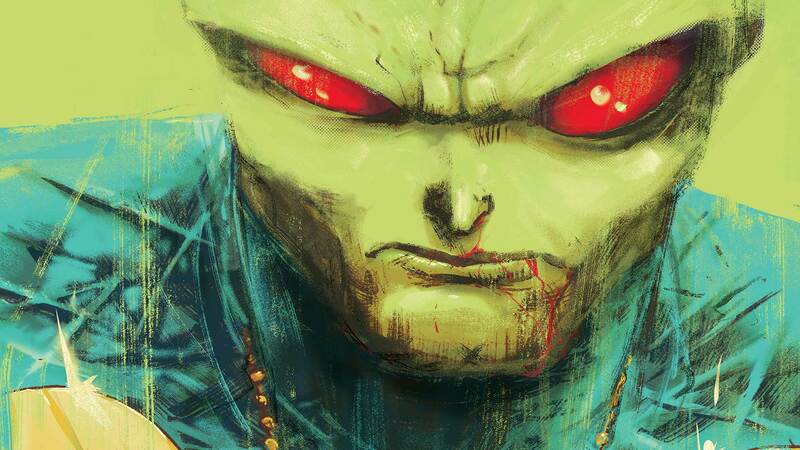 J’onn J’onnz is back on the case and this time it’s a rough one. J’onn and his partner are called to investigate a grizzly murder of a husband and wife. As the two start their investigation, they realize that the couple have a daughter who is missing. J’onn J’onnz is back on the case and this time it’s a rough one. J’onn and his partner are called to investigate a grizzly murder of a husband and wife. As the two start their investigation, they realize that the couple have a daughter who is missing. J’onn checks out her bedroom and there he starts to have flashbacks of his past on Mars. J’onnz was a member of law enforcement on the planet and had a loving wife and child. In the past, J’onzz undertook a similar investigation. Where these two intersect? It’s up to J’onn to find out. As someone who has limited knowledge about Martian Manhunter, I found this story by Steve Orlando interesting. Not only does Orlando start to reveal the origin, he sets up the overall investigation. Orlando doesn’t reveal too much in this first issue and leaves the reader questioning a lot. I like this style of storytelling. It’s one that hooks the reader and starts to slowly reel them in. I also found myself enjoying the film noir feel of the story. Yes, this is a superhero book but that takes a backseat to an engaging first chapter of a mystery. The art by Riley Rossmo elicited some mixed reactions from me. There are some absolutely gorgeous panels here and they definitely move the story along. However there were times when the art just took me out of everything that was going on. There is a series of panels that feature J’onn and his wife on Mars engaging in “relations”. It was in these panels that I found myself wanting more from the mystery and less from the past. Also, it’s in these moments where it feels like an abrupt shift in tone and story. Hopefully the art gets better but I do not see it getting any better. I have mixed feelings about this first issue, in that I want to like it. There are times when every aspect of the story and the art starts to gel but they are outweighed by too may shifts in tone. In no way am I saying that this creative team isn’t talented but maybe they aren’t the good choice for this book.